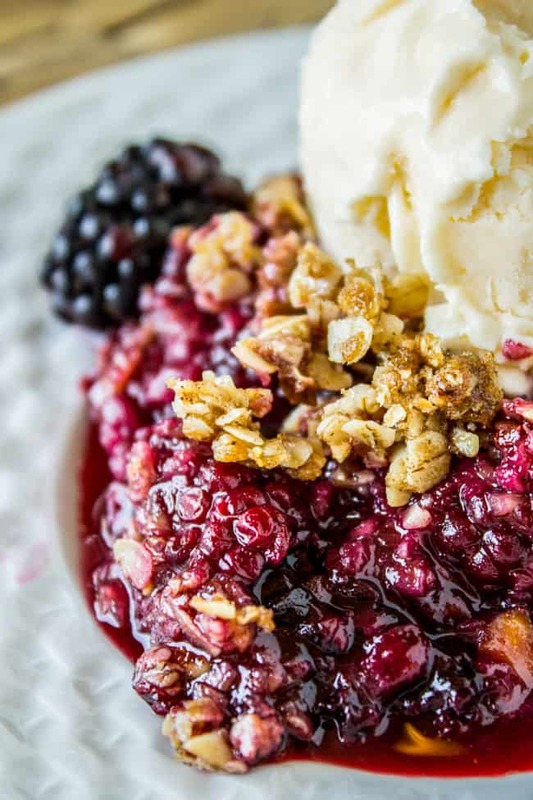 This to-die-for easy Blackberry Cobbler recipe is ridiculously simple to make! The crunchy oat topping comes together super fast, and is the perfect compliment to summer's finest offering: blackberries. Preheat the oven to 375 degrees F. Grease the sides of a square pan, either 8x8 or 9x9. If you are using frozen berries, drain them. (I drained mine until they were about halfway thawed. There was still quite a bit or moisture in them.) Drink up that juice, don't be shy now. Add berries to a medium bowl. Add white sugar and cornstarch and stir. Transfer the mixture to the square pan. In another medium bowl, combine oats, chopped almonds, brown sugar, and cinnamon. In a small bowl, melt the butter. Add the butter to the oats and stir. Cover the berries with the oat topping and spread around. Bake at 375 for about 25-30 minutes, or until lightly browned on the top. Serve with vanilla ice cream! Seriously. Don't skip it. This recipe as written as written makes a pretty wet cobbler, which is how I like it. If you prefer less, make sure you drain your berries very well (or use fresh) and you could even add another tablespoon or two of cornstarch if you'd like it more thick.